final delivery of your new Mascot costume. 1) Your company can request a Catalog or information from PROMASCOT. We have the capabilities to send you our PROMASCOT presentation in PowerPoint format. 2) At this point, PROMASCOT will create some free drawings in Black & White, or also in Color. 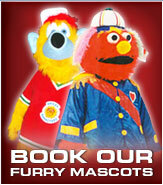 3) A quote will be generated based on your preference of choice for your Mascot costume design. allows us to begin the construction process. 5) PROMASCOT will then mail you samples of material for your approval. 6) Your Mascot costume head will then be constructed, and you have the opportunity to approve it. including all the accessories of your Mascot outfit. You will then be able to approve the final product. expect the final payment minus your deposit. 9) PROMASCOT will then either deliver OR ship your Mascot to you so the fun can begin! and service with our combined expertise and experience!! !